If you go ahead and check out the map at the bottom of this article, you’ll see that the Segenter Village is located in the West Lombok district. You might also notice that it’s pretty close to the legendary Mount Rinjani and some of the best-known waterfalls on the island – Tiu Kelep And Sendang Gile. This fact automatically makes it a popular tourist spot. The Sasak people that have been living there for ages are still living in the same village as their ancestors. It’s safe to say that if you want to learn more about these people, their culture, traditions, and way of life, this place will tell you more about them than any website on the Internet (except for this one, of course). Lombok is famous for the authentic temples, mosques, and villages. Sadly, as Indonesia is slowly, but steadily moving towards modernization, the island is starting to lose some of its charm. And while I’m very happy for the locals, as the new developments are making their lives better, the unique, exotic Sasak culture is fading away. That’s especially true given the fact that the young generations aren’t really interested in staying in Lombok and following their parents’ path. Fishing, weaving, pottery – those are just some of the crafts/arts that will probably be lost in the nearest future, simply because the kids want to study and create better lives for themselves. With that said, I’m happy to state that the Segenter Village is one of those spots that still look and feel exactly like they did many centuries ago. There, you’ll find everything you wanted to see, including ancient traditions, cute little houses, hard-working men and women, and an amazing atmosphere of a friendly community. Don’t worry: you won’t be lost on your way to the village, because the entrance is big and shiny. The government of Lombok built it recently. However, in total, the village is pretty old and the buildings are starting to “rust” a bit. But the locals aren’t used to asking for help – they take care of themselves and take pride in that. Now, to enter the Segenter Village, you’ll have to go through a gate. It’s actually the only way in (and, obviously, out). The entire village is surrounded by a pretty tall fence; so, don’t try to jump over it! The locals have three hectares of land at their disposal and are making the most of it. Without a doubt, this isn’t the best settlement on the island, and you’ll instantly see how challenged these people are. On the other hand, the streets are clean, every single person is busy working, and the tourists are loved and respected. As one of the few places in Lombok that carry on the good old Indonesian traditions, it’s a magnet for the foreigners, and they are used to being in the center of attention. Have you heard about the berugaks? Essentially, these buildings that can be turned into homes, cafes, restaurants, and even hotels. The Segenter Village is full of those. Most of the houses are made from bamboo. The art of weaving an entire building is one those things that keep the community going. Thanks to the fact that Indonesia is among the warmest countries in the world, the locals don’t have to worry about making those walls thick to protect them from the cold. There are some winds in the area, that’s true, but they can’t really do any damage. A standard house usually has a bedroom, a kitchen, a room where the owners put all of their stuff, and a “special” room. I’m talking about inan belek. It sits in the middle of the house and welcomes the newlyweds. Other times, especially when a certain family doesn’t have a shed for rice, they put it in this room. In the Segenter Village (and many other communities on the island), it’s customary for entire generations to live in the same place. The parents live in a house on the east side; the kids build a house on the west side. That way, they have their privacy and can always visit each other without having to drive for hours to reach their loved ones. That’s pretty clever, isn’t it? The children in the Western Civilization usually try to run as far from their parents as possible! 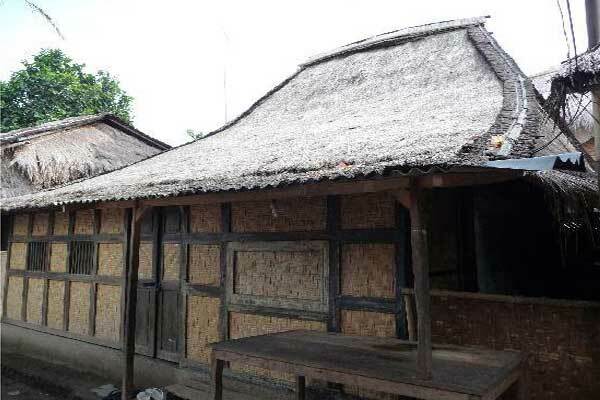 Another interesting fact about these houses: between the two, the locals build a berugak (4×6 meters). There, they meet each other, study, keep some important stuff, and also welcome guests. As for the rice shed, they try to put it in a spot that’s accessible from all sides. Overall, there are 80+ houses in the Segenter Village and 100+ families (at least that’s what people told me when I was visiting). Again, I gotta mention that since the locals don’t really have a lot of money, they can’t spend any funds on improving their living conditions. The government isn’t quick to help, which means they are forced to live in pretty bad conditions. The walls are still strong, and they will serve for years, if not decades. But the roofs are very old and brittle – you don’t even have to be a construction worker to understand that they desperately need fixing. According to some professionals I talked to, the roofs for these kinds of houses need to be changed every 11-15 years. With everything said and done, I highly recommend you to pay the Segenter Village a visit. Who knows, maybe the Lombok officials will decide to move these people elsewhere or build new houses instead of the old ones, and you’ll miss your chance to see the village as it is today – raw and unfiltered. Public transportation is slow and unreliable in Lombok – that’s the truth. So, unless you want to get stuck waiting for a bus and/or get cramped up for hours (that’s because public transports on this island usually leave when they’re full), consider renting a vehicle. The tropical climate might be a big turn off once you arrive at the Segenter Village. For maximum comfort, try to visit it early in the morning, or, at least, during the afternoon. It might be a bit tricky to find the place, even with the big gate at the entrance. Ask one of the locals for directions. There aren’t any food stalls, let alone restaurants in the area. So, bring your own food and drinks. As mentioned earlier, the world-famous waterfalls, along with the gigantic mountain, are right around the corner. Make sure to visit those spots as well while you’re still in Lombok. Oh, and don’t forget to check out my reviews! Even without any guidance, you’ll still be able to find your way to each landmark. There’s a parking area near the village and a bathroom. Other than that, there aren’t any public facilities there. Keep that in mind and don’t expect the Segenter Village to be extra comfortable. After all, it’s not a 5-star hotel, but a Sasak village that’s barely getting by. Ok, now let’s check the best routes to our destination. From Mataram, you’ll have to drive for about two hours to get there. The road is 70-80 kilometers long (depending on where you start your journey in the city). There’s only one route between the two spots, and I’m happy to say that you’ll be driving through wonderful fields and forests. The Senggigi Beach, Pemenang, and the Tanjung village look amazing. You have two options: to rent a car/bike and enjoy the road in total solitude. Or, if the 2-hour ride sounds tiresome, hire a personal driver and relax in the back seat. You’ll still be able to enjoy the scenery, but without the wind in your face. If you’re planning on staying in Lombok for more than a day, it would be a good idea to rent a hotel room before you even land. That’s because during the high season, all the rooms may be taken in advance. Even if you get a place to crash in Mataram, which is pretty far, you’ll be able to spend many hours admiring the village and make it back there before the end of the day. Smart planning is very important during trips to foreign islands. Alright, that’s it for today! After being to so many villages in Lombok, this one still managed to impress me. I've always been fascinated by the Sasak people and this village was something of a revelation for me. I was shocked by the lives that these people lead. They are poor but happy most of the time. The gate is pretty big, but we decided to hire a guide, and he showed us the right way. The opportunity to learn more about this people is priceless. I'm glad had the chance to do that!